In FHRP operation, two or more routers are represented as a single _virtual_ router. 2. A network administrator would like to ensure that router R1 is always elected the active router for an HSRP group. Which set of commands would ensure the required results? 3. What is a best practice to use before beginning an EtherChannel implementation? 4. Which statement describes an EtherChannel implementation? 5. Refer to the exhibit. A network engineer is troubleshooting host connectivity on a LAN that uses a first hop redundancy protocol. 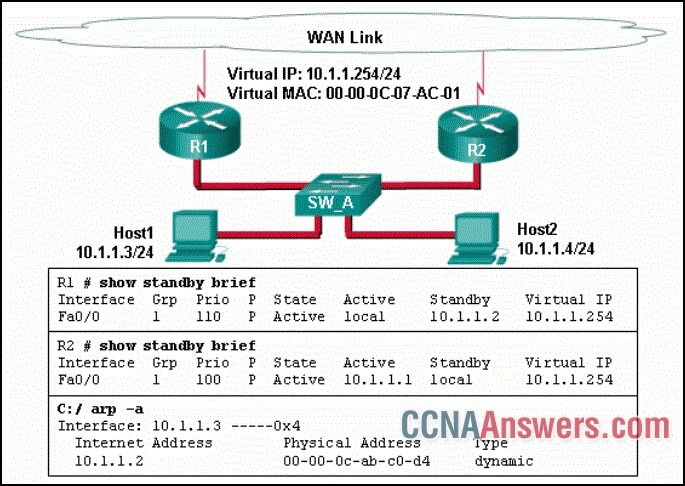 Which IPv4 gateway address should be configured on the host? 6. Which statement describes a characteristic of EtherChannel? 7. An EtherChannel link using LACP was formed between two switches, S1 and S2. 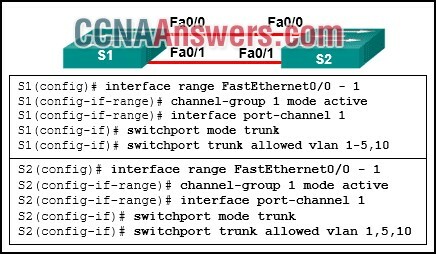 While verifying the configuration, which mode combination could be utilized on both switches? 8. Refer to the exhibit. Which switching technology would allow each access layer switch link to be aggregated to provide more bandwidth between each Layer 2 switch and the Layer 3 switch? 9. Refer to the exhibit. A network administrator configured routers R1 and R2 as part of HSRP group 1. After the routers have been reloaded, a user on Host1 complained of lack of connectivity to the Internet The network administrator issued the show standby briefcommand on both routers to verify the HSRP operations. In addition, the administrator observed the ARP table on Host1. 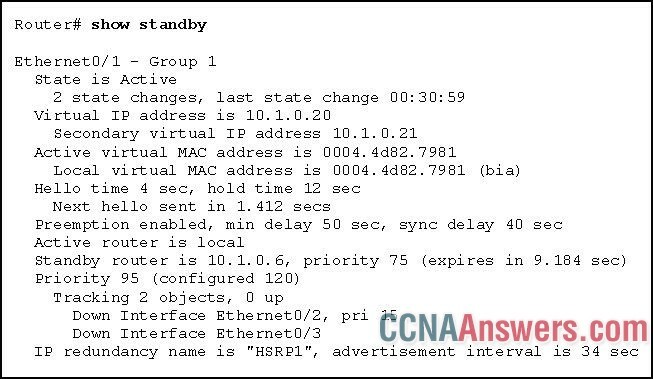 Which entry should be seen in the ARP table on Host1 in order to gain connectivity to the Internet? 10. What is a requirement to configure a trunking EtherChannel between two switches? 11. What is an advantage of using LACP? 14. 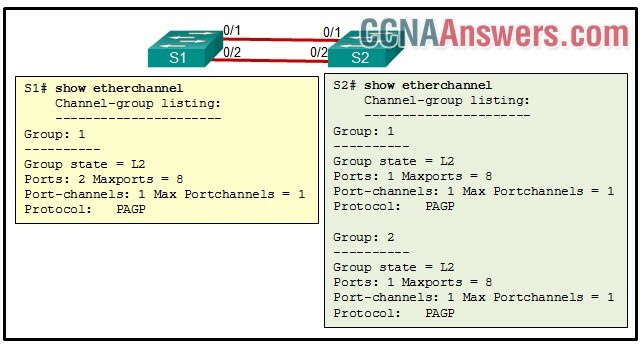 A network administrator is configuring an EtherChannel link between switches SW1 and SW2 by using the command SW1(config-if-range)# channel-group 1 mode passive. Which command must be used on SW2 to enable this EtherChannel? 16. Refer to the exhibit. What statement is true about the output of the show standby command? 17. Refer to the exhibit. An EtherChannel was configured between switches S1 and S2, but the interfaces do not form an EtherChannel. What is the problem? 18. Which PAgP mode combination will establish an EtherChannel? switch 1 set to desirable; switch 2 set to desirable. 19. Refer to the exhibit. A network administrator issued the show etherchannel summarycommand on the switch S1. What conclusion can be drawn? 20. Which statement is true regarding the use of PAgP to create EtherChannels? 21. What is the purpose of HSRP? 22. Refer to the exhibit. Based on the command output shown, what is the status of the EtherChannel? 23. Which nonproprietary protocol provides router redundancy for a group of routers which support Ipv4 LANs?